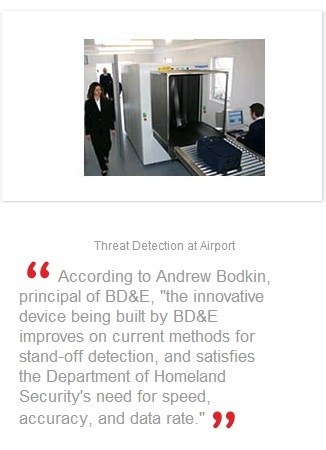 Bodkin Design & Engineering, LLC (BD&E) has been awarded a Small Business Innovative Research (SBIR) contract from the U.S. Department of Homeland Security (DHS) to develop a stand-off explosives detector based on photothermal emission. This instrument will allow detection of explosives and other chemical residue on people and luggage at airport security check points. It will become a component of penetrating scanners such as luggage x-rays and millimeter wave imaging scanners to allow simultaneous detection of internal contents and surface chemical residues. According to Andrew Bodkin, principal of BD&E, “the innovative device being built by BD&E improves on current methods for stand-off detection, and satisfies the Department of Homeland Security’s need for speed, accuracy, and data rate.” There are several methods currently available for acquiring chemical signatures, but they are limited in their ability to meet the requirements of the DHS . The innovative device being built by BD&E utilizes photothermal emission to allow the chemical signatures to be observed with thermal imaging cameras. Key applications include chemical defense, autonomous material identification, and homeland security. This six month project is funded under the SBIR Program, a program established by the Small Business Administration Office to ensure that the nation’s small, high-tech, innovative businesses are a significant part of the federal government’s research and development efforts. Bodkin Design & Engineering, LLC has been providing concept development, prototype design/build, and engineering services to commercial, military, international OEM, and research communities since 1992. Headquartered in Newton, Massachusetts, BD&E has had contracts with the US Army, Air Force, Navy, Department of Homeland Security, National Aeronautic and Space Agency, and the Missile Defense Agency for several highly competitive innovative optical engineering projects. In addition, BD&E has overseen the successful introduction of products ranging from miniature infrared cameras and spectrometers to heavy equipment for railroad yards. To learn more, visit the website at http://www.bodkindesign.com.